In 1435, 30 years after the death of Amir Timur, Kok Gumbaz, the largest mosque in Shakhrisabz, was opened. 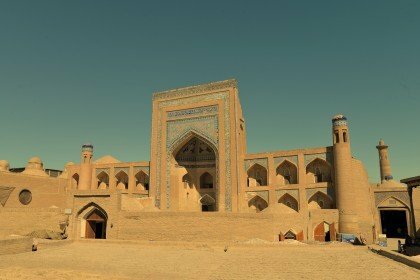 The creation of this mosque was conceived, on the one hand, as a tribute and homage to its eminent Timurid family. This is confirmed by the inscription left by the masters at the entrance to the mosque, which tells that the mosque was erected "From Father Shahrukh". On the other hand, the sacred place became the center of attraction of all believers in one place. On the third, the prayer center was an excellent logical completion of "Dorut Tilavat", the architectural complex. 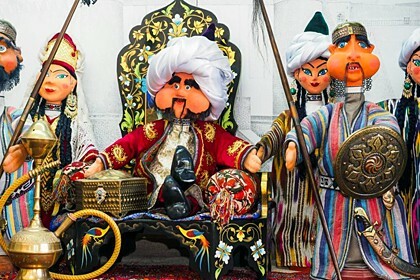 The rich architectural structure was designed in the style of the 15th century by talented artists, invited by Mirzo Ulugbek, the ruler of that time. Burnt and white bricks were used in the laying of the building, on top of which patterned tiles made of majolica, blue glaze, luxurious molding were incorporated. Ornaments and murals are mostly white, blue flowers, as well as calm and warm colors. 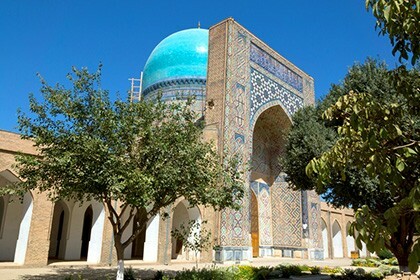 To make the place of religious veneration look so majestic and beautiful, especially against the background of the residence of the "Ak-Saray" Palace of Amir Timur, Mirzo Ulugbek (an outstanding scientist astronomer, public and statesman) urged not only skillful artists and architects, but also mathematicians and architects. They had to calculate accurately the height of the mosque, the supporting towers, the perimeter of the inner halls. 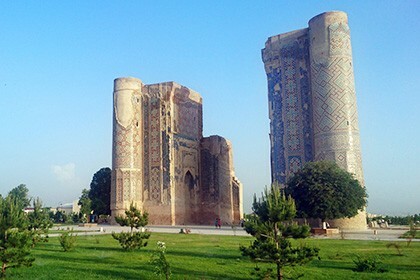 So that the structure was symmetrical to the mausoleum of Shamsiddin Kulal, and a dome 46 meters in diameter could solemnly and permanently stand for many centuries. Inside the mosque there are four spiral staircases leading to the roof of the dome itself. 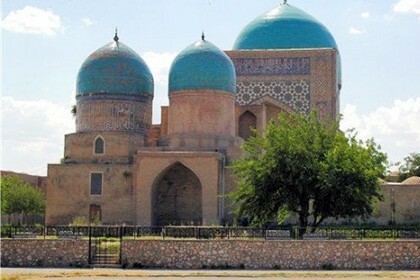 To this day, Kok Gumbaz mosque has preserved its appearance and is the main shrine in Shakhrisabz. The mosque is visible practically from any point of the city. 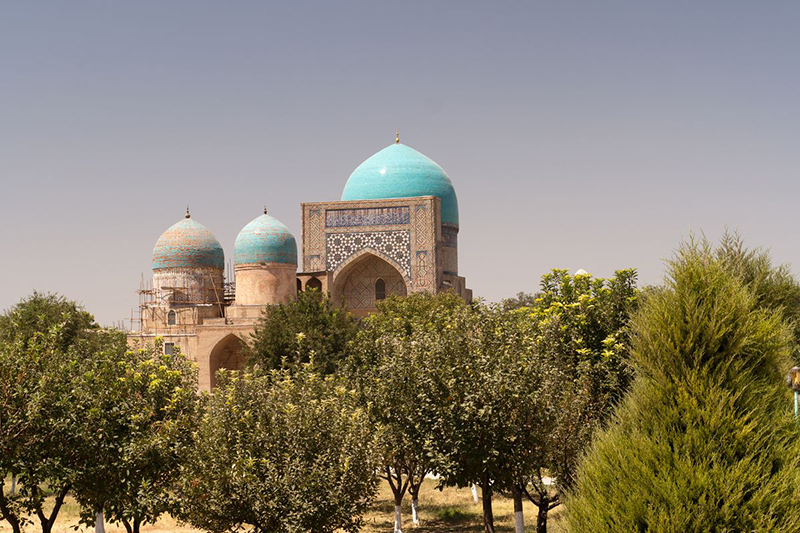 A radiant transparent blue dome, visible over the greenery of the city, beckons to itself. Entering the mosque, tourists feel the grandeur of the universe and the importance of its destination. Many are looking for solitude in such an unusual place.